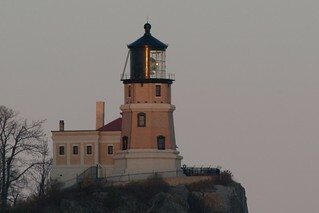 Split Rock Lighthouse - Again! My wife and I visited Two Harbors again a couple of weeks ago and made the trip up the shore to visit my favorite place in the world -- Split Rock Lighthouse. It was a spectacular fall day and we hung around until sunset to get a few more shots of the Lighthouse from the Pebble Beach on the State Park side of Split Rock. It was worth the wait.